﻿We have a few all organic lavender bushes, that do not really deserve to be named 'bushes' anymore; they are more like the size of Kansas! Since it is harvesting season for these wonderful flowers, I was waiting patiently for the moon to move into an air sign, for best flower drying results. Today in the afternoon, after 4pm to be precise, moon moved into libra, an air-sign. Armed with scissors and thread (to tie the bouquets with) I went to work. 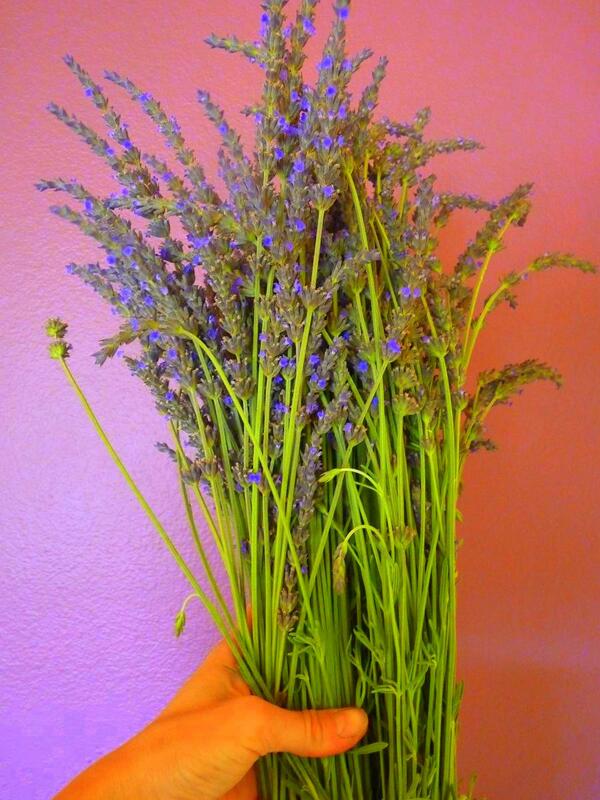 Now every room has a huge bundle of lavender hung up to dry and the scents is amazingly aromatherapeutic. We will sleep soo well. And you cannot even see that these so-called bushes got a trimming of at least 5 lbs. Guess, I will do some more cutting. Of course now I need to figure out what to do with this abundant beauty. I am already thinking of making sleeping sachets from the dried flowers. If I get all ambitious and adventurous, I may try making lavender soap. U can make beautiful sleep (adult) and crib pillows by buying the inside throw stuffing uncovered at a place like JoAnne's. 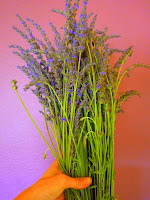 Cut out a well in the middle and fill with lavender. Make a pillow cover/sham. For baby pillows,u can buy an iron-on applique. Repurposed an old linen skirt years ago and made into lavender baby pillows and gave as gifts. Got a lot of oos and ahs at the baby showers! That's wonderful!!! Will look into that!!! THANKS!! !